As the Olympic spectacle grows, broadcast coverage becomes bigger, more complex, and more sophisticated. Part sporting event, part reality show, and part global festival, the Olympics can be seen as both intensely nationalistic and a celebration of a shared sense of international community. This book sheds new light on how the Olympic experience has been shaped by television and expanded across multiple platforms and formats. Combining a multitude of approaches ranging from interviews to content analyses to audience surveys, the book explores the production, influence, and significance of Olympic media in contemporary society. 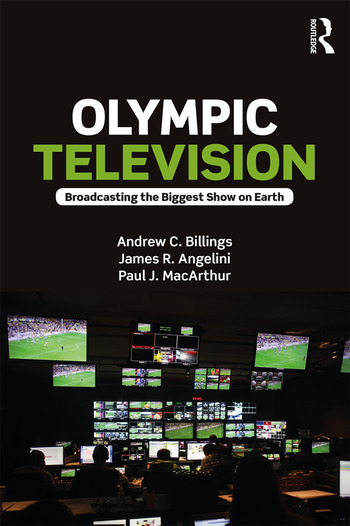 Built on a central case study of NBC’s coverage of the Rio Games in 2016, which is then placed within 20 years of content analyses, the book focuses on the entire Olympic television process from production to content to effects. Touching on key themes such as race, gender, history, consumerism, identity, nationalism, and storytelling, Olympic Television: Broadcasting the Biggest Show on Earth is fascinating reading for any student or scholar with an interest in sport, media, and the global impact of mega-events. Andrew C. Billings is the Ronald Reagan Chair of Broadcasting and Executive Director of the Alabama Program in Sports Communication in the Department of Journalism and Creative Media at the University of Alabama, U.S. He has published and/or edited 15 books, including Olympic Media: Inside the Biggest Show on Television (Routledge, 2008) and The Fantasy Sport Industry: Games within Games (Routledge, 2014), as well as over 140 academic journal articles and book chapters mostly focusing on the intersecting roles of media, sport, and identity. James R. Angelini is an Associate Professor in the Department of Communication at the University of Delaware, U.S. He has published 29 articles in outlets such as the Journal of Broadcasting and Electronic Media, Sport in Society, and the Journal of Language and Social Psychology. His research interests include the cognitive processing of media with a focus on mediated sports and identity. Paul J. MacArthur is a Professor of Public Relations and Journalism at Utica College, U.S. His research interests include the Olympics, mediated sport, cable television, media law, media history, sports history, winter sports and professional wrestling. A veteran of the cable television and radio industries and an accomplished freelance writer, MacArthur’s writings have appeared in multiple publications including Smithsonian.com, Down Beat, The Houston Press, VERMONT Magazine, and Skiing Heritage: The Journal of the International Skiing History Association. He has also co-authored more than a dozen refereed articles focusing on television presentation of the Olympic Games.